Tonight was Game 6 of a very close series between the Canucks and the Predators. It shouldn’t have been a close series given the difference in “star power” between the teams. Unfortunately the Predators have managed to keep it a very close series, and tonight’s game was full of teeth gnashing, nail biting, and seat-edge-sitting. Stressful. The outcome was positive and now for the first time in seventeen years the Canucks are in the third round. We’re really looking forward to game 1 this weekend! Comments Off on Yay for Round 3! I got around to uploading some photos from our Olympic experiences here. Unsorted and raw, straight from the camera. Enjoy! 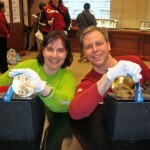 The Canadian Royal Mint hosted a pavilion for Olympic visitors to Vancouver for the 2010 Games. The Mint you say? How could that be interesting? I had exactly the same question, initially. The pavilion is down the street from my office so I see what is going on outside every day. And every day the lines have been getting longer. By mid-day the wait to enter is six hours or more. Turns out they are showing off the medals created for the Olympic event winners. If you wait in line, you can see and hold the medals. How could I resist? Eileen and I went early, lined up at 7am and waited two hours in order to enter. We had fun in line, talking with other people who were equally interested. The people at the front of the line arrived an hour before we did. The picture here is us with the gold and silver medals on display. We also saw the Paralympics medals. It was truly a once-in-a-lifetime opportunity and well worth the wait to get in to see these fabulous artworks. 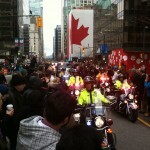 Today is the opening ceremonies here in Vancouver and the Olympic torch has been touring around town. This morning it went by very close to my office so I just had to go see it. Very, very neat to see the flame as well as see how many people came out to see it too. Quite exciting here in Vancouver these days, the city is really jumping. Here is a link to the video I got with my phone, enjoy! Comments Off on OLYMPIC FLAME!